▪ It is highly recommended to always use the latest software update. ▪ After downloading the MADRIX_Full_Install.exe, please double-click with your mouse on this file in order to start the setup process. ▪ Please wait while the Auto Installer is loading the setup. ▪ Afterwards, proceed with the Setup Process as described below. 1] Log into Windows as administrator [Admin]. 2] Let the computer process the setup. This may take some minutes depending on the speed of your computer. 3] Allow Windows to install all drivers. Windows may ask for your permission to install drivers and expects your input. Please search for such pop-up windows; they might covered by other windows. Please install the MADRIX software before you connect a MADRIX KEY or a MADRIX hardware interface. 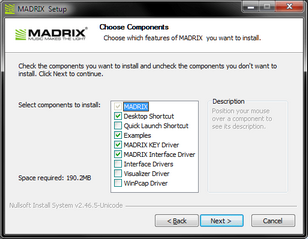 ▪ MADRIX - This component is always required and refers to the MADRIX software and all additional software tools. ▪ MADRIX Interface Driver - Includes the drivers for all MADRIX hardware interfaces, such as MADRIX NEO, MADRIX PLEXUS, MADRIX LUNA, etc. ▪ Desktop Shortcut - Select if you wish to create a shortcut to the MADRIX software on your Windows desktop. ▪ Quick Launch Shortcut - Select if you wish to create a shortcut to the MADRIX software in your Windows taskbar. ▪ MADRIX KEY Driver - Select if you wish to use MADRIX KEY start, dvi start, entry, dvi entry, basic, dvi, professional, or ultimate. This installs the driver for the USB software protection dongle. ▪ Interface Drivers - Select in order to copy drivers for various DMX interfaces. 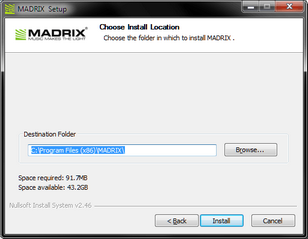 The drivers can be found in the MADRIX installation directory of MADRIX then. This component is not necessary if you only want to use the MADRIX NEO or PLEXUS interface. ▪ WinPcap Driver - Select if you wish to use the EuroLite T9 or ColourSmart Link protocol. ▪ Choose an installation directory on your harddisk where the software will be installed. A default Destination Folder will automatically be provided by the setup. ▪ Browse... - Click to change the folder. ▪ Install - Click to start the installation process. ▪ The installation process may take a few minutes. ▪ Run MADRIX - Deselect if you do not wish to start the software now. MADRIX can search for new software updates. Or let MADRIX automatically search for updates. ▪ Choose Skip Update if you would like to skip a particular version. ▪ View Release Notes - Is a link that will open your default web browser and launch the MADRIX website to show all changes and improvements of MADRIX software updates. 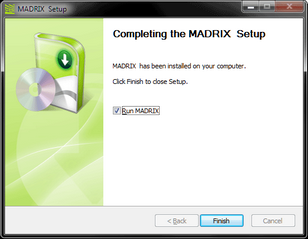 ▪ Download - Is a direct link to quickly download the latest MADRIX software version. 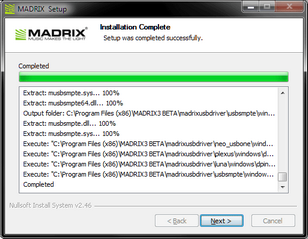 When a new software version has been released, please update your current MADRIX installation to the newest version. 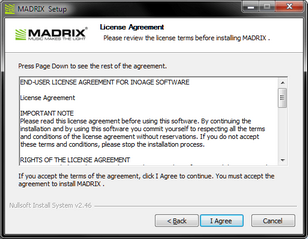 ▪ Check and download the latest MADRIX software directly as described above. 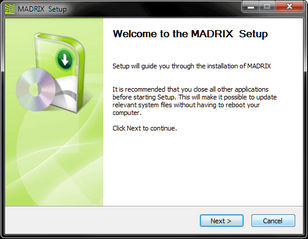 ▪ It is not required to deinstall MADRIX before you install a new software version.